Want to know why physicians do too much? Here’s your answer. Importance Health care costs in the United States are rising rapidly, and consensus exists that we are not achieving sufficient value for this investment. Historically, US physicians have been paid more for performing costly procedures that drive up spending and less for cognitive services that may conserve costs and promote population health. Objective To quantify the Medicare payment gap between representative cognitive and procedural services, each requiring similar amounts of physician time. 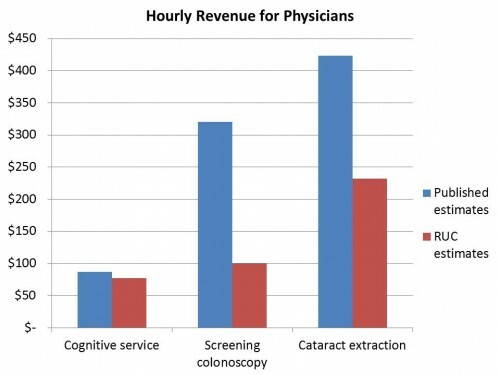 Design Observational analytical study comparing the hourly revenue generated by a physician performing cognitive services (Current Procedural Terminology [CPT] code 99214) and billing by time with that generated by physicians performing screening colonoscopy (Healthcare Common Procedure Coding System code G0121) or cataract extraction (CPT code 66984) for Medicare beneficiaries. Participants Medical care providers of outpatient services. Exposure Work relative-value unit assigned to physician services. Main Outcome and Measures Payment for physician services. We talk all the time about specialty care and primary care, and fee-for-service versus salaries physicians. But these are abstractions. What we want are data. Here you go. This study compared the difference in reimbursement between procedural care and cognitive care. What’s cognitive care? Careful history taking, clinical assessment, care coordination, and the management of multiple chronic conditions, commonly termed cognitive care, are core activities of primary care. The RUC has 31 members, 22 of whom are appointed by national medical specialty societies, 5 of whom are appointed by the American Medical Association or its representative bodies, and 4 of whom are 2-year rotating members, with one of these positions reserved for a primary care representative. Thus, although PCPs constitute nearly half the physician population, they represent only 16% of the voting members of the RUC. A detailed review of the RUC process is beyond the scope of this report, but that process has significant methodological limitations. The RUC method uses self-reported times for services in which the purpose of the survey (to establish payment rates) is known to the respondents who stand to benefit by inflated estimates. McCall et al found that RUC survey data overestimated the procedural time by an average of 31 minutes across 60 procedures when compared with objective data from operative logs. A detailed review of the RUC process is beyond the scope of this post, too, but it’s been in the news a lot lately. The process needs some serious re-consideration. Read Austin here, here, and here. It’s not that a gastroenterologist can make more than a primary care physician. 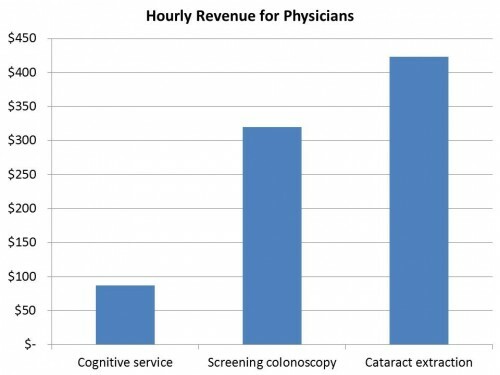 It’s that a gastroenterologist himself can generate more revenue in less than two hours doing screening colonscopies than he could providing cognitive services all day. What do you think happens? Doctors are human. An endoscopy center that applies best practices will put a gastroenterologist on the clock if it’s believed she is performing the procedure too fast – that is, faster than the protocol. Not surprisingly, studies (The New England Journal of Medicine) have shown that colonoscopies that take longer detected more abnormal growths. It’s not a race against the clock in endoscopy centers that apply best practices. I mention this to avoid an impression that physicians (not only gastroenterologists) have an unregulated incentive to perform as many procedures as possible. It’s not easy for staff to confront a physician, but a task made much easier with a clear protocol and the support of the medical director and administrator. As I stress every time I touch on an issue like this, I’m not making a moral judgment. I doubt many physicians are specifically lying or rushing. But doctors are human, and respond to economic incentives as all humans do. One approach, implied in this post, is that primary care physicians should have higher incomes than they do, relative to specialists. OK, why should that be? Is this a fundamental principle, a starting point, and the only question is how to get there? Or is this a consequence of an analysis that shows that raising relative incomes of PCP’s will achieve some socially desirable outcome? Will it reduce the severity of externalities in pricing of medical services? If procedures are compensated too richly, and we make a OSFA decision to reduce prices for colonoscopy, will that lead to fewer or more procedures? Will the proceduralists give up and take more time off? Flip burgers to replace the lost income? Or will they try to make up their losses in unit reimbursement by increasing volume? In a capitalist economy lowering the price would be expected to increase demand, while reducing supply as marginal providers cannot make a profit at the lower price. Are there enough traces of capitalism left in the system for this to occur? The post assumes, as do most discussions of the RVS, that any reductions in compensation to proceduralists will lead to increases for non-proceduralist care providers. Why should that be the case? To the extent that the funds derive from tax money, why assume savings on proceduralist care, if any, will be spent on medical care at all? Why not use that money to increase spending on bridge repair, early childhood education, bigger data centers for the NSA, or even reducing taxes? To the extent that the funds come from individuals directly or through insurance premiums, why not return those excess funds to the individuals? Then each person can decide how to spend it. More movie tickets, more expensive cars or houses, more money saved for education or retirement, fancier vacations, bigger wine collections, all the thousands of things on which people spend their money. I can think of lots of options other than taking money from one set of doctors and giving it to a different set of doctors. In fact, the kabuki arguments about the RUC seem like smokescreens to avoid reductions in total payments to the medical system. In short, how does “We spend too much money on colonoscopy” imply anything beyond “We should spend less on colonoscopy?” I don’t know of a non-proceduralist way to diagnose and remove polyps, but maybe we are doing more diagnosis and treatment of polyps than optimal. If so, then let’s stop doing too much. What to do with the money saved is an entirely different question. This is a good example of why docs should be moved to an hourly payment plan. This would give us (payers) an idea of what costs docs truly are in med bills. Varieties in pay can be arranged via difficulty in practice, if desired. For lawyers, for example, murder defense lawyers make more and can bill more hours than simple misdemeanor defense lawyers. i am not a doc; so I do not know how that plays out in the med field. I assume there are differences in difficulty among areas of practice. And yes you can say it: some (but not all) docs are lying/rushing. Billing requirements make that virtually inescapable. Doesn’t make them bad people; just amoral. As an employer of psychiatrists, I find this very disturbing. The coding is incredibly restrictive and, at least in NC, the reimbursement is laughably poor. But speaking strictly as a patient–I find it hard to believe my colonoscopy only took 13.5 minutes. It seemed like a lot longer than that…. I disagree with the commenter above, who wants doctor’s to be put on an hourly payment plan. I think that will cause more problems than it can solve. Can you imagine a doctor just prolonging your colonscopy so that he can make an extra few bucks… not cool. I’m not an ophthalmologist but no pay increase in 10 years isn’t a good argument that the surgery is being overpaid. what about inflation? what about the extra training to master new skills with better technology? what about the overhead costs in buying new technology? If something stayed the same price for over 10 years, we would all be touting what a bargain it is. 2002 gas prices example would be $2.25. I would love to pay that now. Kudos to Aaron who actually understands how the RUC works…. Most healthcare economists mistakenly think that the RUC single-handedly determines how much doctors get paid, which is not true. I’ve heard more than one “healthcare economist” who says that the RUC has the power to determine whether a doctor gets paid $5 or $5000 for any one code. RUC sets the RVUs, not the prices, which is a CRUCIAL differnece that most people dont understand. The RUC can proportion the total pie of funding given to doctors, but it doesnt have the power to change the size of the pie. Therefore, if the RUC wants to assign an extra 2 RVUs to one code, then it has to take away 2 RVUs from somewhere else. Not exactly, but that is the way one often hear’s the RUC framed. The RUC does not determine the dollar value of any procedure, one has to fold in the conversion factor to get there. However, the RUC is not required to pick some procedure to raise in order to cut the RVU of something else. The RUC could reduce the RVU for colonoscopy, or any other active care, without raising RVU’s for any inactive care. As I noted, if one were to hold the CF constant (which is a unilateral administrative decision), and there were no changes in utilization (which would be nearly impossible to achieve in our messy capitalist economy), then cutting RVU’s for some things, while keeping everything else constant, would lead to a reduction in costs. If colonoscopy is overvalued, then cut it. But that does NOT require paying more for inactive services. How about cutting excess RVU’s for active care, keeping RVU’s for inactive care constant, and saving the savings? The RUC doesnt necessarily HAVE to balance RVUs across CPT codes, but it doesnt matter because CMS effectively does that for them. 2. SGR formula allocates total pool of funding at $X + Y%, with Y being based on prior year’s GDP growth. The end result is that CMS normalizes RVU values based on the SGR formula, effectively locking the total reimbursement pool. Seems like the RUC is set up like the Senate. Giving way too much power to small states…or smaller specialities. If the RUC is working properly, then proportional representation is beside the point. It should not be a political process. This job of assigning values has nothing to do with voting weight, and adding more people from a favored field would not be expected to advance the goal of getting the relative values “right”. In fact, one would expect exactly the opposite effect. That is an approach one would take if the goal were explicitly NOT to base the decisions on scientific grounds, but rather on politics. One might decide that an objective assessment of relative values is impossible, even without the pressures brought by the financial incentives. Then it would become a purely political process and it would make sense for all providers to lobby Congress and the Administration for higher fees for themselves, and perhaps lower for others to keep the proposals cost neutral. But at that point, one would have to question the purpose of the entire exercise. You would no longer be trying to come up with reasonable relative values. You would just be splitting up the pie, and fighting over who got the biggest piece. Cut the overpriced services, increase the rates for nothing, save the difference. It is not clear that proportional representation by number of physicians would help with any of these questions. It would help with the question “In this room, which group can shout the loudest ‘I want a raise’?” But no one is asking that. Cut the overpriced services, raise nothing, and save the money.